Does the opener of your steel gate show signs of breakdown? Fret no more because our gate repair services in California aim to extend outstanding gate opener installation and fixes of all kinds. We have different brands of openers, gates, and accessories. Excellent 24/7 emergency service for gates. Our Gate Repair Canyon Country is a licensed,bonded and insured contractor which shows to our residential and commercial clients the best of services in this domain. We do professional services like manufacture wrought iron gates (all types) grills, security bars, window bars and wood gates. This is only a short list of the services that we regularly offer to our customers. We have a 24 hour emergency service in place so that we are always here for you. Contact us soon we would love you as a customer. We can be useful when there is trouble or a need for new gates. We replace gate parts and install intercom systems. As specialists in electric gates, our technicians can handle any problem with your opener. We repair, replace, and service residential gate openers and promise fast response in case of urgent problems. Broken parts won't serve anything and will only create trouble. We have the means to troubleshoot the gate meticulously and promise to repair the system the right way. Thanks to our expertise, maintenance service is also conducted with excellence. We are gate intercom repair experts, fix openers, replace motors, program clickers and adjust the gate. Ensuring smooth gate operation that will guarantee our customer's safety is our priority, and we see to it every time we are called for service. Anyone who knows anything about driveway gates knows that they can be heavy. They can also be a nuisance when you are having to stop, get out and open or close the gate everyday. This is why we install and repair driveway gate openers. We offer the best brands in the domain of the openers such as: FAAC, Elite, Doorking, All O Matic, Eagle and Ramset. Incude in our list of services: MULTICODE, Linear, Reno and Viking. For any problems with your driveway gate opener in Canyon Country we will be at your home right away to repair or replace it. Wrought iron fences are a speciality of the driveway gate contractor that we work with in Canyon Country. 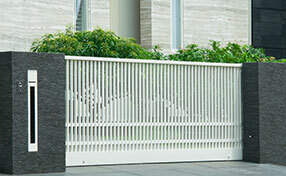 Wrought iron fences are beautiful especially when you can customize them according to your needs. For instance, we do special wrought iron fences that cover all the types of covers, but also any kind of block pillars for the fence. 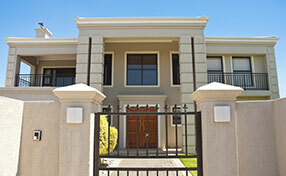 We always work with reliable fence contractors. Our company is proud of the work in the field of welding services and for our expertise when it comes to iron work. Our list of services includes Window Guards, Security Doors, Guards and Railings and different types of cages. Our custom made gates services that we are ready to do to our customers in Canyon Country includes as well: sliding gates, iron gates, driveway gates, custom made pedestrian gates, barrier arm gates. We are ready to cover the needs of both our commercial and residential customers. If you want to find out more about what we can do for your, feel free to call us as soon as possible at our Gate Repair Canyon Country. As a reliable driveway gate contractor, we are ready to offer a variety of install and gate repair services. We are honoured to offer to our commercial and residential customers many services, such as: gate track repair, hinges welding, broken gate repairs, commercial and residential broken gate spring repair. In addition, we operate various install gate motor on existing gate, exit loop installation and safety gate sensor repair install. Last but not least, our list of services includes the phone entry systems-intercoms service. Our professional team is ready to help you with the LINEAR, DOORKING and ELITE programming service, as well as with the repair and install services for phone gate systems, commercial and residential Entry Systems. As you might know already, you should always work with a driveway contractor that is bonded, insured and licensed. Our Gate Repair Canyon Country company is here to do the best possible work very fast and in accordance with the highest professional standards. The major hardware components that enable the operation of swing gates are the hinges. Even though there are different design options, each hinge comprises of two parts. One part is welded to the gate frame and the other one to the post next to it. In this way, as the hinges move, the gate swings back and forth. There is a need for gate hinge repair in case of damage and/or malfunctioning. When there is no serious damage to the component, the repair involves rust removal and lubrication. In case of bending, a technique for straightening is applied. When the hinge is severely damaged, seriously worn or completely broken, it is replaced with a component of the same design, size and make. 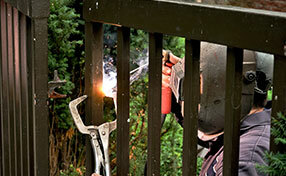 Hinge welding repair involves fixing of the metal joint between the hinge and the panel or post. It is strengthened with the addition of molten metal which allows for better binding. We offer our customers the best quality of gate repair services. When we are called to repair a gate, we begin by doing a thorough evaluation of every part of the gate. This enables us to more accurately assess the situation and provide you with the solution you need, be it repair or replacement of any kind. We are the most reputable and reliable gate service in the area as we offer everything you need for your gate in one place. Whether you need gate intercom or gate repairs, we’ll be able to provide them both to you. Get fast and affordable service from us today. A gate or enclosure is perhaps one of the most visible signs of security as it sends a message to outsiders that they should not enter the establishment, unless they know the people living inside or they have legitimate business to do with the commercial establishment. How to Fix Rusty and Decaying Iron Gates? Steel gates, regardless of whether they’re wrought, or ornamental iron gates, truly make for a classy and worthy investment for the home. However,the main drawback of getting steel gates is that these are more prone to corrosion and rust. Let’s face it, besides looking good and enhancing curbside appeal, one of the main reasons you consider a residential gate installation is that it provides a measure of safety and security. Gates let you control who enters your property.